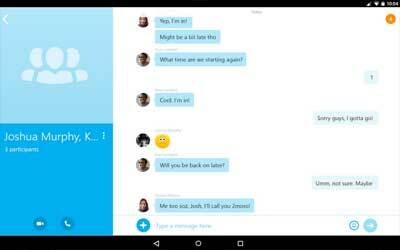 This is old version Skype 7.10.0.458 apk for Android, you can install it if you want to downgrade or install old app. It is top Communication apps from Skype. Moreover, the other good thing from this app is that it can be used for many devices starting from PC up to the portable devices such as tablet and smartphones. Thus, you can do the communication anytime and anywhere. However, this Skype has two cons, and the first is about the service issues. Since this app needs the Internet connection, so when the connection is bad, it will cause the problem when you are calling by using this app. After that, for the second one is the crashes. Sometimes, is people use this Skype for Android in a desktop or the devices non Android, it usually happens. Therefore, it must be better for you to use the devices supported by Android system. Skype Mojis: Send short clips from your favorite movies and TV shows in a Skype chat. Whatever device your friends or family use, Skype just works. Simple. New localization support for Arabic and Hebrew, with the addition of right-to-left (RTL) user interface.